An easy step is to simply not use straws. When ordering your drink at an establishment, simply say, "no straw please, thank you," at the end of your order and encourage your friends and family to do the same. If you really love straws, you can bring your own reusable stainless steel straw, which are available at places like Target and Amazon. Due to its toxicity, plastic straws may not be something you want in your drink regardless. They are made of a petroleum byproduct called polypropylene mixed with colorants and plasticizers and don't biodegrade naturally in the environment. They are also nearly impossible to recycle, so nobody really bothers. Some are incinerated, which releases toxic chemicals into the air, but most end up in the ground, where they will hang around for an estimated 400 years and leach chemicals. That means that every straw ever used still exists on this planet. You can also simply ask your local food businesses to stop using them. Clean Water Action has been spearheading our Rethink DisposableTM program in New Jersey. This program has a proven successful track record working with restaurants and institutions to voluntarily reduce waste caused by single-use disposables (SUDs), such as plastic straws, cutlery, plates, water bottles and foam take out containers. In doing so, they have reduced their environmental footprint and cost of waste disposal and supply purchases, while increasing customer satisfaction and demand for greener-conscious restaurants. 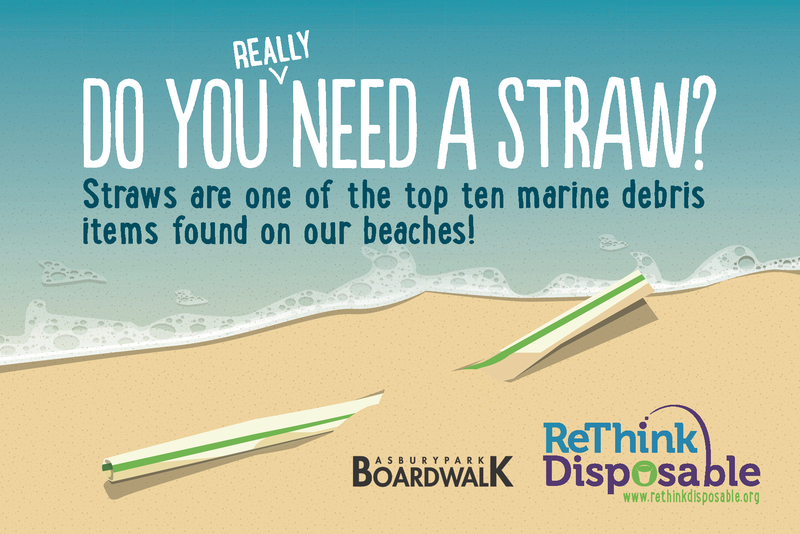 In partnership with the Asbury Park Boardwalk, we are launching a "Straws by Request" program this Memorial Day Weekend in Asbury Park, NJ. Participating establishments include Asbury Oyster Bar, The Anchor's Bend, Beach Bar and Wonder Bar. Drinking straws will be given to customers only by request. Look for the signage and educational postcards located at both the entrance, tabletops and the bars. Clean Water Action and the Asbury Park Boardwalk encourage all customers to participate. We are excited that the Asbury Park Boardwalk and its participating restaurants have chosen to be part of the solution to marine debris, local litter, and storm water pollution. Be sure to say thank you to the restaurant staff for implementing the program and encourage them to do more to reduce single-use throwaways. Through this program, we can help prevent plastic waste on our beaches and get everyone to think twice about whether they need a straw to enjoy their cool drink at the Jersey Shore. We hope Rethink Disposable will be contagious, not just in Asbury Park, but in all Jersey Shore towns. It's important to recycle and clean up litter from our communities and beaches. But it's also critical to prevent the waste from getting the in the first place. 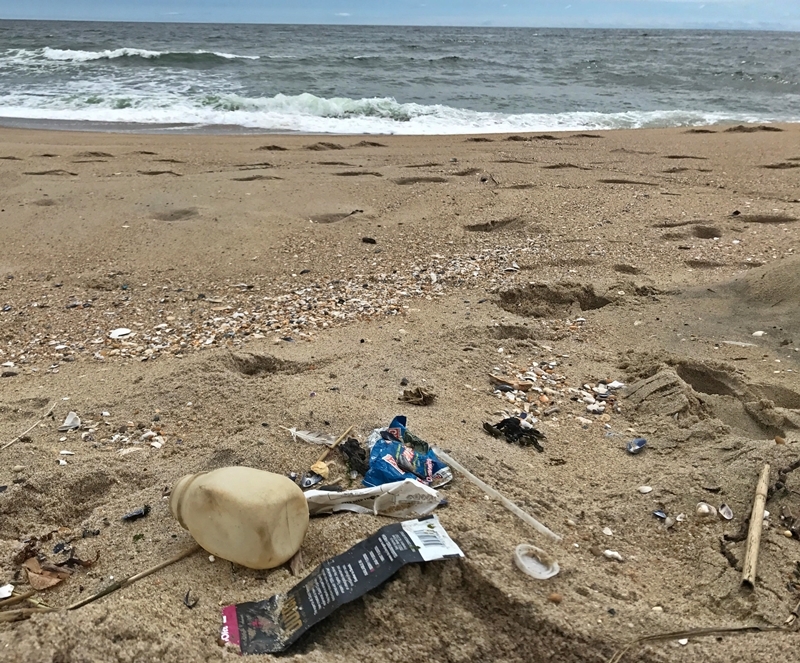 In New Jersey, some of the most common pieces of litter found on beaches are plastic pieces, lids, food wrappers, cigarette butts, foam pieces, plastic straws, bottles and bags. As reliance on single-use disposables has increased, recycling rates have not been able to keep up. In the U.S., 2.4 million tons of plastic were recycled in 2010, which sounds great until you realize that that’s only 8 percent of the plastic generated. As an individual and business, there are so many things you can do to reduce your disposables footprint. Make a pledge to continue doing the ones you already do, and choose new actions you are willing to commit to. If you are an individual, there are easy ways to reduce your disposables footprint such as saying no to straws and bringing your own shopping bag, reusable water bottle, food container and utensils, and more. Join the Reuse Revolution - take the pledge today! The Rethink Disposable TM program in New Jersey is funded by an agreement awarded by the U.S. Environmental Protection Agency (EPA) to the New England Interstate Water Pollution Control Commission.